7th Bn, The Queens Own (Royal West Kent Regiment), 53rd Brigade, 18th Division, B.E.F. Next of Kin: Husband of Frances Elizabeth Isobel Panting (nee Lloyd). Albert Panting was born in Welland on 17 February 1878. The 1901 Census shows that he was working at Kensal Rise at this time, but he came home to marry Frances Elizabeth Isobel Lloyd in Birmingham on 30 July 1904. 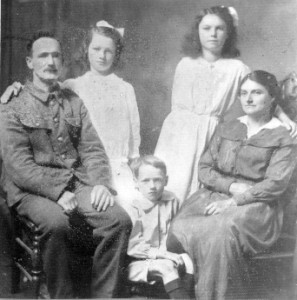 The couple moved to Kent and had three children, Olive Helen (born 1905), Florence Beatrice (born 1907) and Albert George (born 1908). At the time of joining the army at Faversham, Kent, Albert Panting gave his home address as Malvern Link, but at this time the family were living at a lodge house associated with Mote Park, Bearsted, Kent, the home of Sir Marcus Samuel. It may have been the case that the house came with the job, and on joining the army Albert’s family moved back to Malvern Link to live with his wife’s parents Evan and Elizabeth Lloyd who lived at “Howsell”, Yates Hay Road. They and at the time of enlisting at Faversham, Kent he gave his home address as Malvern Link. Apparently, after Albert was killed, his Padre visited my Frances Panting and told her that he had been wounded and left in a field where he would have been recovered later. However, when the soldiers returned, he was never found, so it was assumed he had been blown up.